Houses and heavy items are individually priced. 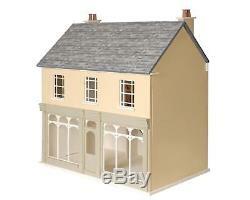 Melody Jane Dolls House 1:12 To Assemble Unpainted MDF Victorian Cafe Kit. British made - MDF - Flat packed and unpainted ready for you to decorate in the style you choose. This item is suitable for new or experienced collectors and for children over 7 years of age with adult supervision. Charming High Street Shop / tea room. Stair railings, banisters and newel posts. Overall Sizes (W x D x H) 605 x 375 x 650 mm (14.75 x 23.75 x 25.5 inches). The ground floor has a wide central arch which gives an overall ground floor area of 550 x 330 x 210mm (21.5 x 13 x 8.25inches). Room 1 - 220 x 330 x 190mm (8.5 x 13 x 7.5 inches). Room 2 - 330 x 330 x 190mm (13 x 13 x 7.5 inches). The front opening review gives access to the attic rooms. PLEASE NOTE: Northern Ireland, Highlands and Islands and any non UK mainland addresses are not included in the U.
SKU: DH001 / Barcode: 8800159376733. PLEASE NOTE: All of our items are miniatures for doll's houses and miniature scenes, they are NOT life size items. We cannot be held responsible for any misunderstanding of this fact. Over 4,500 Stocked Items With items added every day, you're bound to find what you need! We've got you covered! 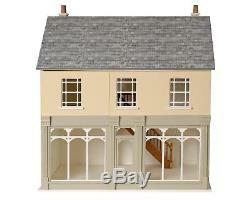 The item "Melody Jane Dolls House 112 To Assemble Unpainted MDF Victorian Cafe Kit" is in sale since Thursday, September 4, 2014. 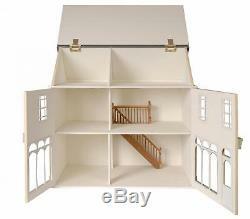 This item is in the category "Dolls & Bears\Dolls' Miniatures & Houses\Dolls' Houses". The seller is "melodyw41" and is located in Abergele. This item can be shipped worldwide.